In SQL Server, you can use CONVERT function to convert a string with the specified format to a DATETIME value. In MySQL, you can use STR_TO_DATE function if you need a specific format, or CONVERT if you need the default format. 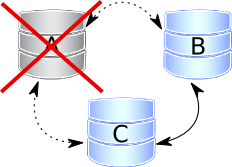 Note that the order of parameters in SQL Server and MySQL CONVERT functions is different. 주석을 해제하여 외부에서 접근 하는 것을 막을 수 있다. open file 쪽에 1024로 설정 되어 있습니다. 재접속 하면 변경된것을 확인 할 수 있습니다. 하지만 실제 운영을 하려고 하면 , DB에 발생된 장애 처리를 해야 합니다. 아래 percona.com 자료에서 설명 하고 있습니다. 운영시 발생할 수 있는 상황에 대해서 잘 설명 해주고 있습니다. safe_to_bootstrap: 1 // 0으로 변경 한다. 위와 같이 변경을 하면 어느 정도 해결이 됩니다. 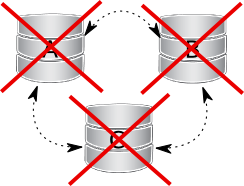 Galera replication for MySQL brings not only the new, great features to our ecosystem, but also introduces completely new maintenance techniques. 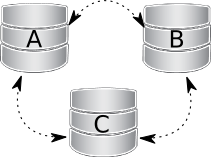 Are you concerned about adding such new complexity to your MySQL environment? Perhaps that concern is unnecessarily. I am going to present here some simple tips that hopefully will let fresh Galera users prevent headaches when there is the need to recover part or a whole cluster in certain situations. 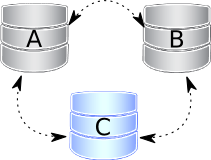 I used Percona XtraDB Cluster (project based on Percona Server and Galera library + MySQL extensions from Codership) to prepare this post, but most if not all of the scenarios should also apply to any solution based on MySQL+Galera tandem you actually chose, whether these are binaries from Codership, MariaDB Galera Cluster or maybe your own builds. Unlike standard MySQL replication, a PXC cluster acts like one logical entity, which takes care about each node status and consistency as well as cluster status as a whole. This allows to maintain much better data integrity then you may expect from traditional asynchronous replication while allowing safe writes on multiple nodes in the same time. This is though for the price of more possible scenarios where database service will be stopped with no node being able to serve requests. Lets assume the simplest case cluster of nodes A, B and C and few possible scenarios where some or all nodes are out of service. What may happen and what we have to do, to bring them (or whole cluster) back up. Node A is gracefully stopped. Likely for the purpose of maintenance, configuration change, etc. In this case the other nodes receive “good bye” message from that node, hence the cluster size is reduced and some properties like quorum calculation or auto increment are automatically changed. Once we start the A node again, it will join the cluster based on it’s wsrep_cluster_address setting in my.cnf. 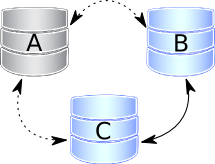 This process is much different from normal replication – the joiner node won’t serve any requests until it is again fully synchronized with the cluster, so connecting to it’s peers isn’t enough, state transfer must succeed first. If the writeset cache (gcache.size), on nodes B and/or C has still all the transactions there were executed during the time this node was down, joining will be possible via (usually fast and light) IST. Otherwise, full SST will be needed, which in fact is full binary data snapshot copy. Hence it may be important here to determine the best donor, as shown in this article. If IST is impossible due to missing transactions in donor’s gcache, the fallback decision is made by the donor and SST is started automatically instead. Nodes A and B are gracefully stopped. Similar to previous case, cluster size is reduced to 1, hence even the single remaining node C forms a primary component and is serving client requests. To get the nodes back into the cluster, you just need to start them. However, the node C will be switched to “Donor/Desynced” state as it will have to provide state transfer to at least first joining node. It is still possible to read/write to it during that process, but it may be much slower, depending how large state transfers it needs to send. 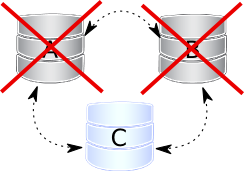 Also some load balancers may consider the donor node as not operational and remove it from the pool. So it is best to avoid situation when only one node is up. In older PXC versions, to bootstrap cluster, you had to edit my.cnf and replace previous wsrep_cluster_address line with empty value like this: wsrep_cluster_address=gcomm:// and start mysql normally. More details to be found here. Please note that even if you bootstrap from the most advanced node, so the other nodes have lower sequence number, they will have to still join via full-SST because the Galera Cache is not retained on restart. For that reason, it is recommended to stop writes to the cluster *before* it’s full shutdown, so that all nodes stop in the same position. Edit: This changes since Galera 3.19 thanks to gcache-recover option. Node A disappears from the cluster. By disappear I mean power outage, hardware failure, kernel panic, mysqld crash, kill -9 on mysqld pid, OOMkiller, etc. Two remaining nodes notice the connection to A node is down and will be trying to re-connect to it. After some timeouts, both agree that node A is really down and remove it “officially” from the cluster. Quorum is saved ( 2 out of 3 nodes are up), so no service disruption happens. After restarting, A will join automatically the same way as in scenario 1. However, you should double check in order to be very sure the other nodes are really down before doing that! Otherwise, you will most likely end up with two clusters having different data. 140821 15:57:15 mysqld_safe Logging to '/var/lib/mysql/percona3_error.log'. So the last committed transaction sequence number on this node was 2. Now you just need to bootstrap from the latest node first and then start the others. 140823 15:29:59 [Note] WSREP: Received NON-PRIMARY. 140823 15:29:59 [Note] WSREP: wsrep_notify_cmd is not defined, skipping notification. 140823 15:29:59 [Note] WSREP: STATE EXCHANGE: Waiting for state UUID. 140823 15:29:59 [Note] WSREP: Bootstrapped primary 00000000-0000-0000-0000-000000000000 found: 3. 140823 15:29:59 [Note] WSREP: Service thread queue flushed. 140823 15:29:59 [Note] WSREP: Member 1.0 (percona3) synced with group. 140823 15:29:59 [Note] WSREP: Member 2.0 (percona1) synced with group. After that, you are able to work on the manually restored part of the cluster, and the second half should be able to automatically re-join using incremental state transfer (IST) once the network link is restored. But beware: if you set the bootstrap option on both the separated parts, you will end up with two living cluster instances, with data likely diverging away from each other. Restoring network link in that case won’t make them to re-join until nodes are restarted and try to re-connect to members specified in configuration file. Then, as Galera replication model truly cares about data consistency – once the inconsistency will be detected, nodes that cannot execute row change statement due to different data – will perform emergency shutdown and the only way to bring them back to the cluster will be via full SST. I hope I covered most of the possible failure scenarios of Galera-based clusters, and made the recovery procedures bit more clear.